John “Red” Hamilton, aka: Three Finger Jack (1899-1934) – An associate of John Dillinger and Pretty Boy Floyd, Hamilton was a native of Canada who had lost two fingers on his right hand somewhere along the line, earning him the moniker “Three Finger Jack.” He was arrested in 1927 for robbery and sent to prison in Michigan City where he became friends with John Dillinger and Harry “Pete” Pierpont. Using guns smuggled in by Dillinger, Hamilton, Pierpoint and others escaped from the prison on September 26, 1933 quickly formed the Dillinger Gang, which robbed banks all over the Midwest. 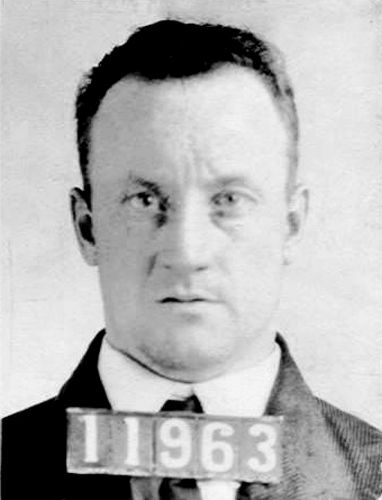 While hiding out with the gang in Chicago, Hamilton was caught in a garage by Chicago police sergeant William Shanley. Hamilton shot the officer, causing the whole Dillinger Gang to flee to Florida. A month later, Hamilton, Dillinger, and Pierpont robbed the bank at East Chicago, Indiana and killed a police officer in their getaway. Most of gang then fled to Arizona, where a number of them, including John Dillinger were captured but Hamilton did not accompany them. After being extradited to Indiana, Dillinger escaped from the Crown Point Jail in March 1934 and Hamilton quickly hooked back up with him. Along with Homer Van Meter, Baby Face Nelson, and others, they began to rob banks again and after a furious gun battle with the FBI at Rhinelander, Wisconsin’s Little Bohemia Lodge on April 22, 1934, the gang split up. Nelson headed to Michigan’s Upper Peninsula, while Hamilton, Dillinger, and Van Meter fled to Hastings, Minnesota. There, they were ambushed by lawmen and Hamilton sustained a mortal wound in the back. The gang then fled to Chicago and soon holed up at a hideout of the Barker-Karpis Gang in Aurora, Illinois. Hamilton eventually died in the last days of April. The men then buried his remains in gravel pit near Oswego. Later, in August, 1935, the remains were dug up, identified by dental records, and Hamilton was interred in an unmarked grave in the Oswego Township Cemetery.